"This feels Christmassy and celebratory. And it's so easy to infuse pomegranate juice with rosemary then top up with non-alcoholic fizz." 1. Pour the pomegranate juice into a small saucepan. Lightly bruise the rosemary by rubbing it between your fingers and add it to the pan. Bring to the boil and reduce for 10 minutes, then add the lemon juice. 2. Leave to coo, then strain and chill until ready to use. 3. 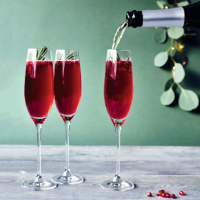 Pour 30ml of the rosemary and pomegranage mixture into 8 Champagne flutes and top up with alcohol-free sparkling wine. Garnish each glass with pomegranate seeds and a rosemary sprig.